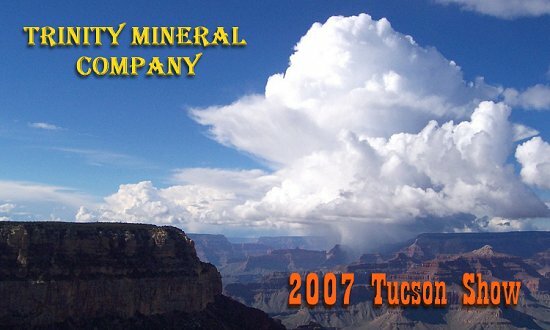 Welcome to the 2007 Tucson Show edition of the MineralShows.Com. SPECIAL NEWS! SPECIAL NEWS! SPECIAL NEWS! Steve Perry and I will be hosting a mini two-day show at my rental house in Tucson on February 4 & 5. We will be presenting minerals and gemstones during this two-day period. My Tucson house is located in the Starr Pass area about 3 miles west of the Tucson Convention Center. If you are interested in visiting Steve and I in this informal and relaxed setting visit this site to see how to get there. We will have beverages available also. The show will start with auctions on the 23rd of January. New specimens will also be posted shortly after this date and the first reports on what is new at Tucson will begin around the 29th of January. For the auctions this year Steve Perry (Steve Perry Gems) will offer fine and rare gemstones and I (Trinity Mineral Co.) will offer up fine mineral specimens. Again, the show will start the 23rd of January with auctions and shortly after that with new specimens. All of the relevant links on this page are located on the bars at the top and bottom of each page. You can now have your special requests registered by visiting the Register your Request Page. All specimens from the last three Auctions and Galleries will be shipped after the 14th of February. Colleen and I are staying over in Tucson for two weeks after the show and will ship from there. Colleen will be shipping the mineral specimens from the first two auctions from Weaverville prior to joining me in Tucson in mid February.